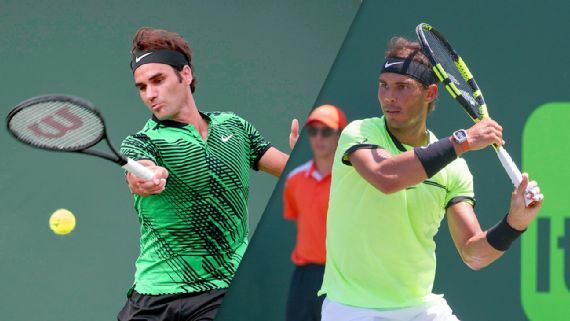 MIAMI -- Thirteen years and 32 Grand Slam titles later, Roger Federer and Rafael Nadal are meeting in the final of the Miami Open, where their rivalry began in 2004. Federer won that first meeting, a third-round clash, 6-3, 6-3. It seems incredible, but we're completely accustomed to amazing when it comes to these two iconic players. But that may not even be the most remarkable aspect of this upcoming final. That honor may go to the fact that Federer has struggled, sometimes mightily, at this event since last winning it full decade ago. And Nadal, who has won 28 of these prestigious Masters 1000 titles, has never hoisted the trophy. Bottom line: These men have won nearly every individual Grand Slam event more often than this tournament. This Miami Masters is played immediately after the Indian Wells Masters event. Win both and you've accomplished a demanding "Sunshine Slam," which Federer did in 2005 and '06. Both men have won Indian Wells a combined eight times (Federer has won five, Nadal three) but only two Miami championships (two for Fed, none for Rafa). The numbers, as well as the arc of the year in tennis thus far, would seem to tilt the odds heavily in Federer's favor. Plus, he's already beaten Nadal twice in 2017 without a loss. In fact, the 36-year-old marvel Federer is 18-1 this year, second in wins to only -- Nadal. But while Federer has won two titles, including the Australian Open, Nadal has yet to win an tournament. History suggests this isn't the most likely place for him to punch through, though Nadal denies his frustrations in Miami will play on his mind. "I don't think [the past] is going to affect me in terms of helping me to win or helping me to lose," Nadal said after a knockout straight-sets win in the semifinals. He has been stymied in five finals here but points out how many he's won at other venues, insisting, "It's not more pressure for me to play here the final than playing in Monte Carlo or playing in Indian Wells. Is the same." Fair enough. Why would the legs of a 14-time Grand Slam champ and the second-most prolific Masters winner go to jelly at the challenge of winning the Miami? On the contrary, he has reason to sleep contently when he hops into bed Saturday night. The main one is that Federer's performance has typically dropped off shortly after his plane from Palm Springs touches down in Miami. Part of that is because compared to the way the ball flies in the dry desert air of California, the slower court surface and the cloying humidity and heat of Miami lessen the pace of the ball. The slower the court, the greater the advantage for Nadal. Moreover, the compressed schedule of the Masters format asks a lot of players who go deep in the draw, especially in Miami, which begins as soon as Indian Wells ends. Federer won the California title and immediately had to board a plane and travel across the country. That can be exhausting. Not to mention that in these events, players are called upon to play three or sometimes four days in succession. As for this event, compared to the slog Federer has made to the final, Nadal's tournament has been a stroll on the beach. Nadal has lost just one set, while Federer got to the final on the strength of brutal, back-to-back, third-set tiebreaker wins. Tomas Berdych almost knocked Federer out in the quarterfinals but failed to convert either of two match points. Six of the eight sets Federer played over a stretch of three matches starting in the fourth round ended in tiebreakers -- and they were played on consecutive days. The fatigue factor ought to be enormous, but after surviving fiery Nick Kyrgios in a three-set, three-tiebreaker barn-burner Friday, Federer discounted its potential impact. "Here we are in the finals, and I get a chance to win the tournament," Federer said, adding that he would have considered a semifinal finish here the capstone to a "fantastic" run. "There is still a mountain to climb in Rafa. He's definitely feeling fresher than I feel right now. That's not a problem. I'll be ready on Sunday." Proud sentiments, entirely justified. And in truth, Federer hasn't showed any of the routine signs that afflict a player with too many miles on the odometer. He doesn't run out of gas late in matches; if anything, he finds ways to raise his game when it's most needed. His concentration doesn't waver for points or games at a time. Most striking, he doesn't go out after playing a number of good matches and produce a real stinker, which is a typical lapse in older players. These men have played 36 times, with Nadal in the lead, 23-13. They are friends as well as rivals. They know each other's games as well as they know the furniture in their own bedrooms, even when the lights are off. In 2005, they faced off here for the second time, this one in the final. At that point, 18-year-old Nadal had yet to win a Masters or make the quarterfinals of a major. Federer, 23, was already a three-time Grand Slam champion but not yet a legend. He had tasted major success starting in 2004, but had yet to demonstrate that he could deal with adverse circumstances, focus and grind over an extended period. Nadal won the first two sets. Shocked by the impertinent youth, Federer buckled down and won in five. Federer called that final "epic" and a "turning point" in his career. "I don't know how long we played, maybe four hours, smashing forehand after forehand down the line," he said of that 2005 final. "I remember feeling like I had to learn how to fight in matches, and there I showed it to myself and my team that I could do it." The loss knocked Nadal on his backside, but he popped back up like one of those inflatable punching bags. He dusted himself off and went gonzo. He won his next four Masters events, as well as the French Open. Guess who he beat on the way to that first Roland Garros title? Roger Federer. There will likely be few surprises Sunday, and there's been only one major change on the technical level. Nadal won't have that Federer one-handed backhand to kick around anymore. The Swiss champ is belting it like never before, partly because his entire mindset, in this year of resurgence, has been more offensive, more geared toward playing inside the baseline. "I'm able to take the backhand earlier," Federer said. "Which allows me also to hit more backhand winners off the baseline, which I enjoy a lot." Who wouldn't take pleasure in that, especially after having been taunted so long by that Nadal lefty kicker to his weaker wing and the crazily spinning forehand drives that Federer so often had to play with a backhand from the vicinity of his Adam's apple. A lot has happened in the decade-plus since they first met. That they're back where their history together began is both remarkable and unexpected. Here we go again. For the 37th time. Roger Federer won a thrilling three-hour contest against Nick Kyrgios to set up a final against Rafael Nadal at the Miami Open. The Swiss, 35, won 7-6 (11-9) 6-7 (9-11) 7-6 (7-5) to take his 2017 record to 18 wins and one defeat. Federer will take on Nadal for the 37th time on Sunday, and the second final this year after beating the Spaniard at January's Australian Open. Nadal, 30, beat Italy's Fabio Fognini 6-1 7-5 in the first semi-final. Fognini, 29, had become the first unseeded player in 10 years to make the last four but was no match for Nadal, who will try to win a first Miami title in his fifth final on Sunday. "It's great to be in the final for me," said Nadal after winning the first of the semi-finals. "I am excited to play another final of an important event. "If it's Roger, it's going to be another one for both of us, and that's it. Just another one." Federer made sure that there will be another episode to his rivalry with Nadal, which began in Miami 13 years ago. The 18-time Grand Slam champion maintained his spectacular run of results with victory over the in-form Kyrgios. "It felt very good," said the Swiss, who last won the Miami title in 2006. "You don't very often play three breakers in a match. "Winning breakers is always such a thrill. I tried to really fight for it. I can't always show my fighting skills, it is great winning this way." Despite playing in front of a heavily pro-Federer crowd, Kyrgios extended the former champion over three hours and 10 minutes, with the 21-year-old Australian showing his frustration by smashing his racquet after losing match point. "I had some ups and downs, bit of a rollercoaster," said Kyrgios. "Ultimately I think I put in a good performance. I thought the crowd would've enjoyed watching it, people at home would've enjoyed watching it. But I wouldn't be surprised if they found something bad, though." On Saturday, British number one Johanna Konta plays Denmark's Caroline Wozniacki in the women's final at 18:00 BST - with live text commentary on the BBC Sport website. Konta, 25, became the first British woman to reach the Miami Open final with a 6-4 7-5 victory over Venus Williams in the last four on Thursday. Once again, Roger Federer set too low expectations for himself heading into a big tournament this year. And once again, tennis fans around the world will be the beneficiaries. After his BNP Paribas Open title two weeks ago, Federer thought a semi-final showing at the Miami Open presented by Itau would be an “unbelievable run”. On Sunday, the 35 year old will play Rafael Nadal for the Miami crown. It will be their 37th FedEx ATP Head2Head meeting and the 23rd time they've met in a final. “Feels like old times. We're playing each other every week now. We can't get enough of each other,” Federer said. Sunday's final will also be the fourth time Federer and Nadal have met at the ATP World Tour Masters 1000 tournament in South Florida. Nadal won their first meeting, which started their rivalry, 6-3, 6-3 in 2004. Federer beat him in the Miami final the next year, coming back from two sets down to win 6-1 in the fifth set. In 2011, Nadal returned the favour, knocking Federer out in the Miami semi-finals, 6-3, 6-2. Federer brings an 18-1 record this season into the title match. But despite his incredible beginning, the Swiss right-hander knows beating Nadal for the fourth consecutive time will be a massive challenge. Nadal will be playing in his fifth Miami Open presented by Itau final, but he has never won the Masters 1000 crown. 0 Response to "Why this Federer-Nadal battle might be the most surprising of all"